With Isobar® heat pipe & Isoplaten® heated platen technology, French integrates hydraulic press technology and thermodynamic heated platen technology for high production, profit oriented molding systems that help your bottom line. Download literature on heated platen technology to learn how French provides engineered thermal solutions with guaranteed results. Isobar® heat pipes are super-thermal conductors that have the capacity to transfer large amounts of heat at high speeds in both heating and cooling applications. 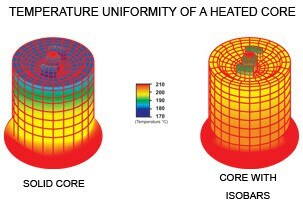 The Isobar® technology provides rapid energy transfer and uniform temperature distribution, which is essential in optimizing thermoset molding. Your bottom line? More high quality parts per hour. Isoplatens®, typically designed with an engineered array of Isobars®, provide high levels of thermal stability to hydraulic press platen applications and can be designed for electric, oil or steam heated systems. The Isoplaten’s® unique thermal uniformity permits the use of one simple single-zone temperature controller for the entire heated platen; no special multi-zone controls and multiple thermocouples are required. Your bottom line? 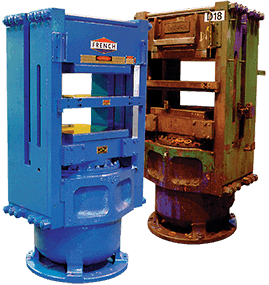 Your process is easier to control and maintain, often at lower capital and operating cost. This state-of-the-art heat transfer technology helps molders increase profits by reducing cycle time and enhancing production through scrap reduction. Many customers report that Isobars® and Isoplatens® gave them a return on their investment in less than six months. Your bottom line? Lower cost, higher profit. Purchase your newest hydraulic press with integrated Isoplaten® systems, revitalize your older French press or improve the performance of molding presses by other manufacturers with the addition of custom engineered Isoplatens®. French can provide improvements to your molding processes and system by evaluating and analyzing your existing equipment. Contact French for more information on how Isobar® & Isoplatens® can help your bottom line.